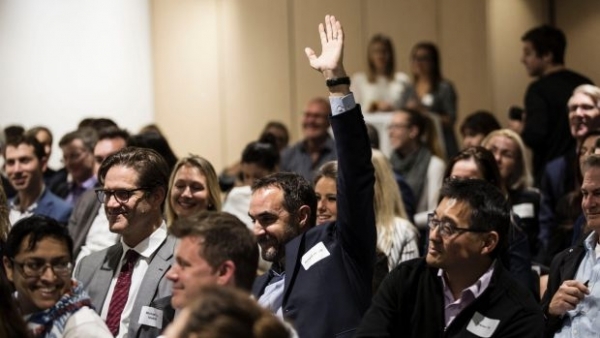 It's an ordinary Wednesday evening when 120 Sydneysiders decide to give away more than $40,000.Think of it as live crowd-funding meets Shark Tank meets MasterChef, replete with strict time slots, nervous contestants and a big reveal at the close. Armed with a drink and an open mind, this miscellaneous group of strangers, colleagues and friends will hear a six-minute pitch from three different social causes, and decide whether to open their wallets, before challenging the room to do the same. On this night, hosted by The Funding Network, it's Toowoomba local Luke Terry who kicks things off. His social enterprise Vanguard Laundry Services started off the back of a not-for-profit initiative supporting people with mental illness seeking employment. He needs $30,000 to buy an industrial-sized tumble drier, to grow his social enterprise. Locked out of the room for the pledging process, Mr Terry can't hear the first person to pledge $100, nor the next who says he will give $500, "if I can get a match from someone else who doesn't do laundry at home." It only takes 10 minutes before Vanguard Laundry Services has received $21,800. 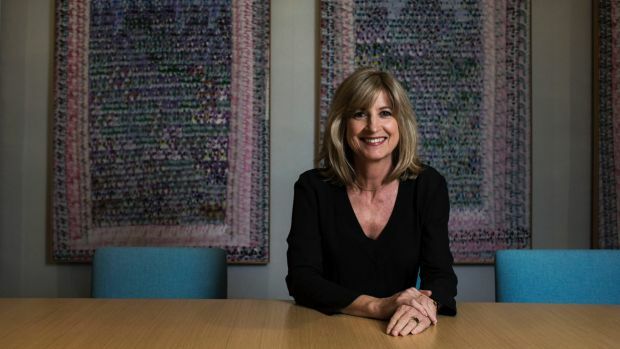 "We call it social contagion," says Lisa Cotton, chief executive of The Funding Network, Australia's largest and most active collective giving group. "It involves a lot of participation. People start mimicking and challenging others. They're inspired and often end up giving more than they intended. It's very hard not to." Also known as giving circles or giving groups, organisations like The Funding Network (TFN) are rare in Australia, where the practice has only operated for the past six years. The organisation is one of 13 internationally to be spawned off The Funding Network UK, which launched in 2002. Collective giving in all forms is donor-initiated and comprised of people who pool their individual donations and decide how the funds will be dispersed. In the US, the most recent research shows in 2006 the practice raised US$88 million, through 160 giving groups made up of 11,700 participants. The first ever analysis of collective giving in Australia, commissioned by the Department of Social Services, found a sample of 17 known established giving groups, including TFN, has raised more than $8.5 million for social enterprises since 2011. According to the report by Creative Partnerships Australia, giving groups differ from traditional philanthropy by offering "a form of democratised and engaged giving". "Traditional philanthropy tends to be regarded as the domain of the very wealthy. By contrast collective giving ... is available to everyone, to participate to whatever degree they wish." Sydney lawyer Kate Jordan first started attending TFN events 18 months ago, taking along her children aged 10, 13 and 15. "I'd heard from my friends it was really good way to introduce children to philanthropy," she said. "And I've never been to an event where I haven't given more than I intended. You dip your toe in the water and you end up diving in." Ms Jordan said TFN events, which she has since introduced at her law firm Clayton Utz, present the life cycle of an organisation to donors, all in a short evening. "You hear from it, you get involved in the giving and then you get to see the remarkable impact in the months following." Patricia Burke runs the Melbourne Women's Fund, another giving group which featured in the collective giving report. As an American, Ms Burke said she perceived obvious cultural differences to the way philanthropy was approached in the US and Australia. 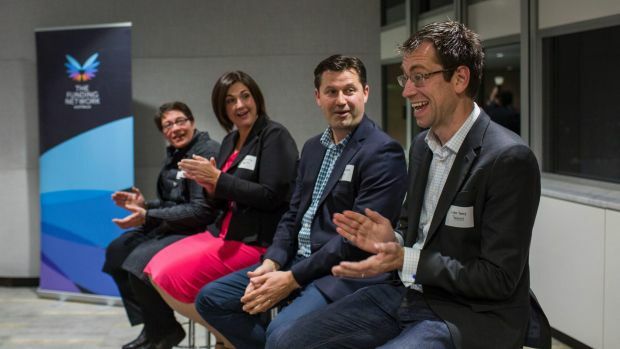 "To work for an employer in the US, they don't ask if you will give to the corporate giving fund, but how much," she said, adding that collective giving had the capacity to grow philanthropy in Australia. The success of Melbourne Women's Fund, which has handed out $300,000 to six organisations in the past three years, is the excitement and "contagion" it spreads among members, Ms Burke said. "It's about a group of people who come together with a shared interest. Who wouldn't be able able to write a cheque for $10,000, but together with 100 people ..."
Read the full article in the Sydney Morning Herald here.